The more heat the distribution system can deliver per watt of electrical power, the higher its distribution efficiency. Hydronic heating system efficiency includes the distribution system — not just the boiler making the hot water. The hydronics industry can do more to spread the word about the benefits and efficiency of this technology. Water is better at holding onto and moving heat than air, making hydronic heating systems inherently more effective in moving heat from point A to point B. During the time I’ve been involved in the North American hydronics industry, there have been significant improvements in the thermal efficiency of hydronic heat sources. The 1960s vintage ranch house that I grew up in is a good example. When built, it was fitted with a baseboard heating system supplied by an oil-fired steel fire tube boiler. The boiler was equipped with a tankless coil for domestic water heating. A Honeywell round thermostat controlled the entire 1,500-square-foot house as a single zone. When I eventually replaced that boiler, the baffles inside the fire tubes were completely burned away. That’s part of the reason the net stack temperature was about 550° F. Although this boiler kept the house comfortable for more than 30 years, its “aged” seasonal efficiency was far below what would be acceptable in 2018. The new oil-fired boiler had a rated heating capacity about half that of its predecessor, and a rated AFUE of 86%. But even that performance number appears lackluster in comparison with currently available modulating/condensing boilers that have the potential to achieve thermal efficiencies in the mid-90% AFUE range when paired up with low temperature loads. Upon hearing that modern boilers can operate with thermal efficiencies in the low to mid-90% range, potential clients, and even some in the hydronics trade, likely conclude that the industry has reached the limit of what’s possible with regard to converting fuel into heat. But just as an oasis fades away when you’re almost to it, so does this illusion of nearly perfect efficiency. Distribution efficiency has nothing to do with converting any type of fuel into heat — instead, it describes how many Btu/hr of heat the distribution system can move from the heat source to the heat emitters for each Watt of electrical power supplied to operate that distribution system. The more heat the distribution system can deliver per Watt of electrical power input, the higher its distribution efficiency. So is that number — (353 Btu/hr)/W — an acceptably high value for distribution efficiency? It’s hard to judge a number for any physical measurement without something to compare it to. In comparing these two specific systems, the distribution efficiency of the hydronic system is almost four times greater than that of the forced air system. That advantage is the direct result of water being far superior to air as a material for absorbing heat. Using modern hardware and careful design, it’s possible to create hydronic systems with distribution efficiencies much higher than the (353 Btu/hr)/W value of the previous example. Imagine a building with a design heat loss of 62,500 Btu/hr being supplied with heat by a distribution system that only requires 25 W. That situation represents a distribution efficiency of 2,500, and it’s very “doable” with today’s off-the-shelf ECM-based circulators, combined with well-thought-out piping practices such as parallel piping and valve-based zoning. I’m reasonably sure that some hydronic heating pros who are reading this article have never used the concept of distribution efficiency to promote the inherent advantages of hydronic systems. Instead, they go from one proposal to the next telling potential clients about boilers that may have thermal efficiencies of 95% AFUE, or showing photos of their “trophy” installation where 20 identical circulators are neatly lined up along the mechanical room wall. That approach lands some jobs and lets others slip away. At a time when many potential clients respond to marketing based on assurances of “high efficiency,” the hydronics industry, as a whole, seems lethargic at exploiting the superior energy efficiency of water-based heating and cooling distribution systems. Consider, for example, mini-split ductless heat pumps and their larger commercial cousins, VRF (variable refrigerant flow) systems. These methods of moving thermal energy though buildings using refrigerant piping are two of the fastest-growing market segments in the HVAC industry, despite the fact that their distribution efficiencies are much lower than hydronic distribution systems (see Figure 1). Another example is water-to-air geothermal heat pumps, which are now the darling of the North American HVAC industry. This is partially due to Uncle Sam’s recommitment (as of Feb. 8) to reimburse homeowners $0.30 for every dollar they spend installing these systems through federal income tax credits. The geothermal heat pump market rests its case on higher coefficients of performance (COP) ratings relative to those of much less expensive air source heat pumps. But what about the distribution efficiency of a water-to-air geothermal heat pump system? 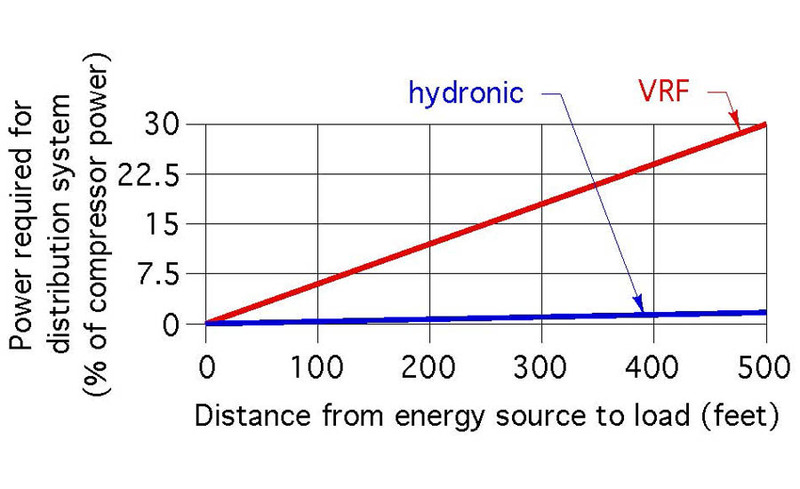 That’s a small fraction of the potential distribution efficiency of a well-designed hydronic distribution system, and yet this stark difference is largely ignored by heating professionals, utilities, energy auditors, government agencies and even politicians prodded by lobbyists, all of whom tend to focus on high thermal efficiency (e.g., high COP). Given the wide spectrum of support for geothermal heat pumps, which are predominantly coupled with forced air distributions systems, it’s not surprising that consumers, even those focused on energy efficiency, are unlikely to hear about the high distribution efficiency offered through properly designed hydronic systems. Those consumers will never pay for COP directly. They will pay for the total kilowatt•hours (kWh) used by their HVAC systems. The hundreds, perhaps even thousands of dollars that a well-designed hydronic distribution system, coupled with a water-to-water geothermal heat pump, might have saved them over the life of the system remains undiscussed and unrealized. The concept of high distribution efficiency should be a starting point (rather than an afterthought) when discussing the potential advantages of a modern hydronic system. Our industry needs to get this message to trade allies such as architects and engineers involved with low-energy or net-zero buildings, energy auditors, professionals involved in thermally based renewable energy heat sources, and regulators who determine which HVAC technologies are incentivized through government subsidies. Hydronic systems stand ready to help state governments achieve what in some cases are very “ambitious” renewable energy implementation targets. At a time when energy efficiency enjoys support from a wide spectrum of individuals, the hydronics industry shouldn’t be leaving its best cards on the table. There are lots of decision makers with eager minds who have never heard about distribution efficiency. Some of them would embrace the concept based on real attainable comparisons. It’s time we tell them what’s possible. To read “The overlooked benefits of radiant” in pdf form, see here.